The Bureau of Labor Statistics (BLS) reported that the U.S. added 209,000 jobs to our economy in July 2014, falling just slightly short of economists’ predictions. July’s job creation was mainly focused in four areas: professional and business services, manufacturing, retail trade and construction. This is the sixth consecutive month that there have been more than 200,000 jobs added to the economy – a feat that has not happened since 1997. Surprisingly, the unemployment rate saw a .1 percentage point rise from last month, bouncing back up to 6.2 percent. The BLS says that the number of unemployed persons changed only slightly from June to July. Over the past year the unemployment rate has seen a 1.1 percentage point drop, decreasing the number of unemployed persons by 1.7 million. The Professional and Business Services sector was the star sector this month, adding 47,000 jobs in July. The sector has been responsible for the addition of 648,000 jobs over the last 12-month period. Subsectors of note include administrative and support services, which added 14,900 jobs, and architectural and engineering services, which saw a 9,000 job gain this month. Temporary Help Services remained notably flat in July, adding just 8,500 jobs, though previous months saw tremendous growth from the subsector. This is not to say that temporary help is not robust, but it’s simply not growing as quickly as the first half of 2014. As reported by the BLS, the Labor Force Participation rate actually ticked up to 62.9 percent, up .1 percentage point, from a three-month freeze at 62.8 percent. Forbes suggests that this is a promising sign, as the uptick indicates more working-age people are looking for work or are currently holding positions. Average hourly earnings only rose one cent in July, sitting at $24.45. The average workweek still sits at 34.5 hours, stagnant for the fifth straight month. In this month’s BLS report, there were two revisions to two previous jobs reports, affecting the number of newly added jobs for those months. In May, it was reported that 224,000 jobs were added; this number has since been revised to 229,000. 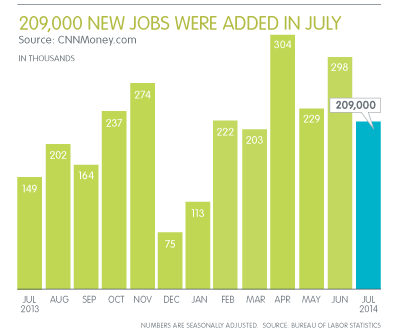 In June, the original report said 288,000 jobs were added, but this number has since been revised to 298,000. With the reported revisions, numbers were actually 15,000 higher than previously reported. You’ll receive instant updates and analysis on the latest workforce and hiring trends impacting our industry directly to your inbox each month. Sign up today.